The Saffier Sc 8 m Cabin offers a variety of opportunities. Unlimited sailing areas, from lake, river or sea, a large ergonomic cockpit and interior fit for 4 adults. 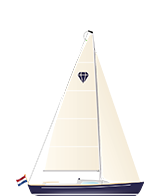 Al this with the well-known sailing qualities of the Saffieryachts brand and build with the latest technologies. The Sc 8m Cabin is designed for people who like sailing. Close to the water instead of high on top, the feeling that you are one with the elements. Ex open dinghy sailors who want to keep just that feeling but with the comfort of a toilet and cooking facilities, a seaworthy cockpit, lots of space inside and a Yanmar diesel engine will certainly appreciate this design. engine, but also the sheets and halyards of the sails are all in reach of the helmsmen who can stay safe in the cockpit while trimming and adjusting the sails. 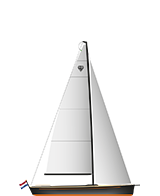 The selftacking jib makes tacking or gybing a maneuver which the Helmsmen can decide when to perform without asking his crew to move around in the cockpit. Your family will find the high stability, spacey room inside and functionality of this ultimate weekend sailer comforting and relaxing. The Saffier Sc 8 m Cabin is seaworthy, self-righting and has a self draining cockpit. 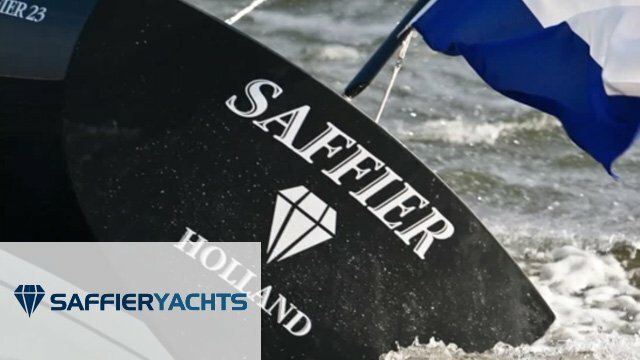 Weather you would like to sail in a small lake, hop along the coast or maybe a trip overseas to France, Belgium or Holland, the Saffier Sc 8m can do it all. And when you really want to explore, the Saffier Sc 8 Cabin is easy trailer behind the car to any destiny you want. 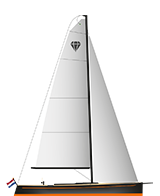 Fibreglass polyester 7mm in thickness and from stern to bow over the keel line 15 mm thickness. Fibreglass around the keel section reinforced with roving to 22 mm thickness. 4 ribs laminated in keel section to transfer forces of keel loads. Water and cove lines laminated in gelcoat. Built up according to the sandwich principle, anti-slip structure in gelcoat laminated into deck and cockpit floor. Deck is finished with toe rails with water drainage outlets. An anchor well is incorporated in the front deck. On the front deck there is an aluminum hatch, which serves as ventilating passage, escape hatch and dome light. A rail for the selftacking jib has been incorporated in the cabin The aft deck has a hatch providing access to storage area. The cabin has been fitted with a single-action polyester sliding hatch. On both sides of the cabin, Plexiglas windows have been fitted. Two handrails have been fixed on top of the cabin. In the front a V berth of 2 m length. On port and starboard side 2 shelves. Underneath the V berth is storage space. Room has been reserved for a toilet under the V berth. In the salon on port and starboard side a seat/ sleep bench of 2.00 m. with storage space underneath. On starboard side there is cooking facilities and a water basin with running water ( 32 ltr). On port side there is a Locker. A fridge* can be installed. Color of the upholstery to your liking. There are enough spots and lamps throughout the inside of the boat. Solid lead installed with 4 x 22 mm nuts and bolts. 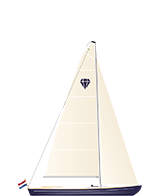 Total draft 1.03 m or the race keel of 1.30 m draft. A balanced rudder with tiller and tiller extension. Ships battery * 75 12V- 75 AH 32 l.
stainless steel diesel fuel tank. At the bow a port and starboard light, a stern light, a top light (3 colors) and a engine light. All valves, skin lead-troughs and ventilators are made of brass. All tubes and wiring have been tested according to the ISO and CE norms. Mast, spreaders and boom are made of aluminum type Sparcraft. The fittings and rigging are made of high quality stainless steel. Boom has been fitted with two reefs (which are passed through into the boom) and a kicking strap. Reefs and kicking strap are led to the cockpit. 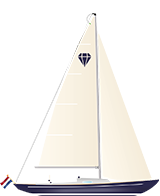 Mast is fixed on the cabin and can be lowered with accessories (not standard). All halyards run through the mast. Main rigging, lower rigging, front and rear stays are made of stainless steel wire with rigging tensioners. 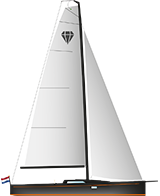 Made from high quality dacron that has been through a stiffening process to make the sails keep their shape and hardwearing. Mainsail comes standard with 2 reefs. Hand-held bilge-pump, 4 fenders, 4 mooring lines.